Hedge funds are still missing the tools needed to address regulatory impositions. Boston, January 29, 2014 – Many challenges within a hedge fund's supporting infrastructure often go unseen to all except the individuals tasked with managing investment operations. 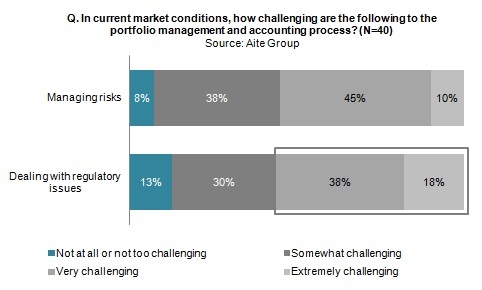 Maintaining efficient and effective governance over the portfolio management process remains a hurdle for firms large and small, and the era of regulatory intensification has added new layers of obstacles to navigate. Hedge fund executives are acutely aware of the crucial tasks at hand. This report, the first in a two-part study of hedge funds' investment management operations, identifies current and emerging trends in the global portfolio management process, including challenges relating to the aspects of operational efficiency, regulatory and risk management, and investment decision-making. It also sheds light on current areas of infrastructure that may require improvements to meet the needs of hedge fund operations. It is based on 40 summer 2013 Aite Group interviews with senior executives or managers at Tier-1 and Tier-2 hedge funds. This 24-page Impact Note contains 24 figures. Clients of Aite Group's Institutional Securities & Investments service can download this report. Investment Fund Processing: From Manual to Automatic?